The VTV581NCC from Hoover is a delightfully cost-effective drying option. 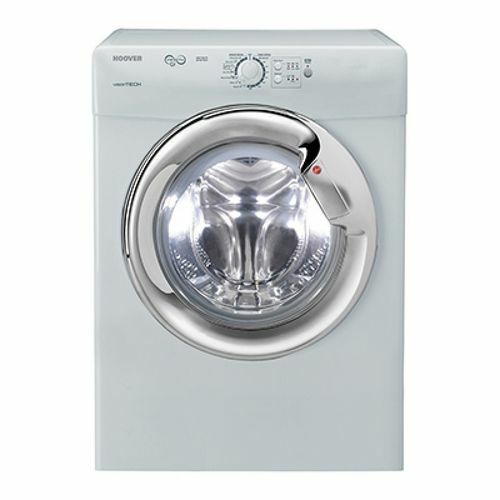 An ample 7kg load capacity is more than adequate for the smaller household while all drying eventualities are covered with an array of carefully designed features. Finished in an attractive, clean white and with the Hoover name promising quality, there's nothing not to like for those on a budget. Whilst the VTV581NCC is undoubtedly pared down compared to other more expensive dryers on the market, it's an outstanding offering in relation to the more-than-affordable price tag it comes with. A total of 4 Sensor Dry programmes allows for an optimised, tailored cycle, letting you select your preferred degree of dryness while assessing and adjusting the load to ensure great clothing care and excellent efficiency. Alongside this is a delicate Wool Finish cycle that treats anything from thick winter socks to your favourite jumper with the gentle touch it deserves, a Rapid 40 setting that's perfect for last-minute plans and an infinitely helpful Relax option to soften creases for easy ironing. Take back control of your time with a delay start of up to 9 hours and make the most of lower energy rates or simply have your washing waiting for when you get home. Besides a wide array of programmes, the VTV581NCC is cleverly designed. The astute drum is capable of highly efficient reverse action drying; by switching the direction of the drum periodically throughout the cycle, tangling is prevented and therefore clothes are dried evenly and in much less time. A user-friendly rotary dial lets you select a drying temperature as well as a programme for customised laundry treatment. Indicators for both Empty Water and Filter Care help to make maintaining the machine effortless while small but significant aspects like adjustable feet make for superbly straightforward installation.